Michele Bilyeu Creates *With Heart and Hands*: Happy May Day In Origin and Deed! Happy May Day In Origin and Deed! Ever since my children were young, we have practiced the tradition of collecting and giving May Day flowers. We would make pretty little baskets or paper doily cones, fill them up with whatever flowers were available in our yard or from the shrubbery, and then hurry to set them by our neighbors doors....knocking to alert them, then running and hiding as quickly as we could. We always expected the tradition to be returned back, and we always enjoyed being 'surprised' anyway. It became a contest to see who would remember the date first and get their flowers first to the door. We looked forward to May 1st, every single year, with great anticipation. 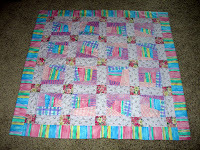 Now, I give the children of those children gifts of quilts, often with flowers, instead. This one above, a gift for an expected newborn. Made with fabrics that the father's mother would have loved in colors they all loved. 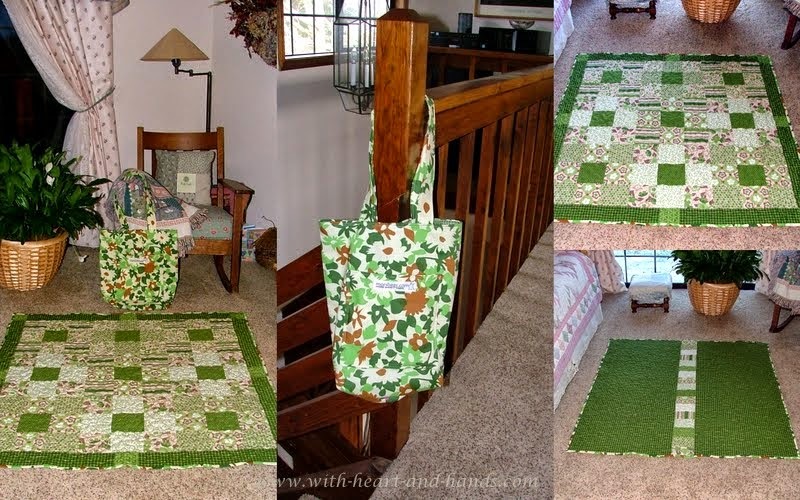 A gift of flowers through fabric in a quilt with a bag to wrap it up in and hang it on a door. One idea, one way to celebrate an ancient tradition in a new way. For traditions are dear, but often we do not know, or remember why we even celebrate them! The origins of May Day, like many of our holidays come from ancient times and cultures. The Druids believed it was the day that divided the year into half and to celebrate this milestone, they lit huge bonfires to signify the burgeoning of the springtime sun. Every one passed through the smoke for purification and good luck. When the Romans came, it changed to a worship of Flora, the goddess of flowers. In her honor, everyone celebrated for five days...April 28 to May 2. Bit by bit, the celebration of the Celtic Beltane, and the Roman Floralia combined. With the advent of the Puritans in the British Isles, rites changed, once again. The old ways may have been put away, and new ones came in, but the tradition of flowers and merriment continued. The tradition of the giving of flowers and dancing around the Maypole (known as 'The Tree of Liberty"during the French Revolution) continue today in many countries and have simply come to signify a welcoming in of Spring. Instead of flowers, I now make and give away little quilts, Fabric + Paper Art Cards, or even Prayer Flags. It is my new way of expressing an old tradition and welcome in the advent of Spring and new life. These, above, went to a new young mother with her first child just born, and to another child, same father, whose other child was in foster care. And one year, a nice long visit to an adult foster home where I sat and drank tea with 3 seniors, all in their 90's, and visited while they ate their breakfasts...you learn so much from others, if you just take the time to care! And of course, nothing older adults love more than a nice visit, some pretty flowers, and a good conversation shared by all! Happy May Day to all of you! What a fun tradition. Lovely quilt. Happy late May Day greetings Michele! Love your May Day traditions. Tried to post yesterday but my 'puter was acting up.